Mercedes-Benz is launching its first series-produced fuel cell car on the road: the new B‑Class F-CELL. The environmentally friendly electric car has better a performance similar to than a 2,0-litre petrol car and is fully suited for everyday driving. The zero-emission drive system consumes the equivalent of 3.3 litres of diesel per 100 kilometres in the NEDC (New European Driving Cycle). Production of the B‑Class F-CELL will commence in late 2009 with a small lot. The first of around 200 vehicles will be delivered to customers in Europe and the USA at the beginning of next year. The new fuel cell vehicle offers everything that people expect from a Mercedes-Benz: High comfort and safety as well as no reduction in interior space and boot capacity. Customers will not have to sacrifice any driving pleasure either, because the electric motor has a peak performance of 100 kW/136 hp and a maximum torque of 290 Nm, which is available from the first rotation. It ensures that the B‑Class F-CELL, whose impressive dynamic handling properties are in some cases far better than those of a two-litre petrol car, gets off to an excellent start. Despite these qualities, the zero-emission fuel cell drive consumes the equivalent of only 3.3 litres of diesel fuel per 100 kilometres (NEDC). Thanks to its great range of about 400 kilometres and short refuelling times of around three minutes, the B‑Class F-CELL ensures local zero-emission mobility even for long stretches. “2009 is the year in which we are establishing further milestones where sustainable mobility is concerned. The B-Class F-CELL is taking on a pioneering role as the world’s first fuel cell powered automobile to be produced under series production conditions”, says Dr. Thomas Weber, Member of the Board of Management of Daimler AG, responsible for Group Research and Development for Mercedes-Benz Cars. The vehicle’s technological heart is the new generation of the compact, high-performance fuel cell system, in which gaseous hydrogen reacts with atmospheric oxygen at 700 bar to generate a current for the electric motor. The fuel cell system of the B‑Class F-CELL has a very good cold-start capability even at temperatures as low as minus 25 degrees Celsius. The drive system was completely newly developed versus the F-CELL A-Class presented in 2004, with Mercedes-Benz engineers achieving considerable improvements in output, torque, operating range, reliability, starting characteristics and comfort. The B-Class F-CELL now offers driving pleasure and day-to-day suitability at Mercedes level – without local emissions. As in hybrids with combustion engines, the fuel-cell car uses a lithium-ion battery with an output of 35 kW and a capacity of 1.4 kWh to boost power and recover braking energy. Lithium-ion technology offers several advantages over conventional batteries, including compact dimensions, high performance, great recharge efficiency and a long service life. The B‑Class F-CELL employs the unique sandwich floor architecture that is well-known from the A- and B-Class. The advantage of this design is that the drive components are located in the sandwich floor, where they are protected and don’t take up much space so that the vehicle’s interior remains fully usable and a boot capacity of 416 litres is available. The B-Class F-CELL does not need to fear comparison where equipment is concerned either. Eye-catching features include a bonamite silver paint finish and exclusive light-alloy wheels in a 10-spoke design. In the interior, leather upholstery, seat heating, automatic climate control and the COMAND-system, as well as other features, continue to ensure a high level of comfort. No matter what the conditions, the operational reliability of the B‑Class F-CELL is of the same high level as in Mercedes vehicles with conventional combustion engines. The B‑Class F-CELL’s integrated safety concept takes the specific characteristics of the innovative drive system into account. The concept incorporates the expertise from the many years of experience Mercedes-Benz has had with fuel cell drives and high-voltage applications. Mercedes engineers have tested and optimised the drive-specific components’ safety in more than 30 additional crash tests. With more than 100 test vehicles and a combined total of over 4.5 million kilometres of trial testing, Daimler and Mercedes-Benz have the most extensive experience with fuel cell vehicles of any manufacturer worldwide. The B‑Class F-CELL is further testimony of this technology’s high level of development for automotive use. However, a comprehensive network of hydrogen filling stations still has to be set up before locally zero-emission driving can become a widespread reality. 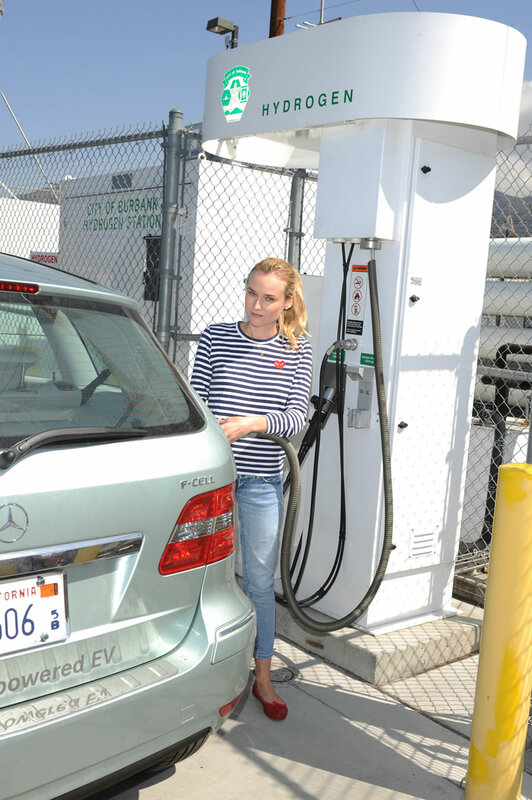 To make this possible, Daimler is cooperating with government authorities, energy utilities and oil companies in joint projects in places such as Hamburg, Stuttgart and California. Mercedes-Benz views the development of electric cars with battery and fuel cell drives for local zero-emission driving as a means of supplementing vehicles with high-tech internal combustion engines. Advanced diesel and petrol engines will remain important for automotive applications for a long time to come – not only for individual mobility in passenger cars – especially over long distances – but, more importantly, for freight transport in trucks. Electric vehicles, on the other hand, will increasingly be used in urban transport.